JAMES Thomson is living proof that a healthy lifestyle is the key to longevity! For on Sunday he celebrated his 103rd birthday — a milestone he attributes to not smoking or drinking, as well as going out for regular walks. Sprightly James can still be seen out and about in Cupar on a regular basis enjoying a stroll or sitting in the sun watching the world go by — always smartly dressed with a shirt and tie. This week he's been busier than usual, with a party at Bathgate Court sheltered housing complex, where he lives, and another at the Age Concern Centre, where he goes for his lunch three days a week. "That's it for another year," said James afterwards, by now accustomed to the celebrity status that goes with being Cupar's oldest man. Born in Dirleton, near North Berwick, James moved to Cupar as a young boy and went to Kirkgate and Castlehill schools before leaving to get a job delivering papers for J&G Innes. He spent a year working with Fishers Laundry before returning to work full-time in the paper shop, where he stayed until 1939. 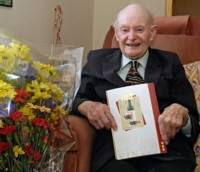 During the Second World War he joined the Royal Engineers as a truck driver, ferrying prisoners to and from the POW camp at Annsmuir, near Ladybank. When the war ended, he returned to a job in Cupar repairing buses. James has remained a bachelor all his life, although he says he 'had his chances'. He's lived at Bathgate Court for over 11 years, and until very recently was often seen doing his own shopping in the Co-op next door. Having just acquired an impressive new flat screen TV, he enjoys nothing more than watching football, but goes out most days for a walk. However he's less than impressed with the world outside, which he says has changed considerably over the years. He recalled: "My car was my hobby; I used to drive all over Scotland, England and Wales — often hundreds of miles a week. "But at that time petrol was only 1s/5d a gallon, so you could afford to. Also, the roads weren't nearly so congested and drivers were much more polite!" James also remembers his youth as being safer than today. He said: "It was a different world altogether. "There was drunkenness, but no knives or violence. "You could leave your door unlocked and go to your bed without any worries." As far as James is concerned, there's no great mystery to living a long life. He says: "I have a clean body. I drank beer and smoked when I was young, but gave it up many years ago. I've had a good life."